People used to have a saying – they would say, “He hasn’t got a prayer.” It was a way of saying that there was no chance the person could ever attain whatever it was that he hoped for, or prayed for. “He hasn’t got a prayer” was a judgment of hopelessness. Because we are so familiar with today’s gospel reading about the Pharisee and the Tax Collector, and because we know which one is commended at the end of this parable, we have usually interpreted the Pharisee to be a villain, though he was a good and decent man. And we have honored the Tax Collector, who was, in truth, a deceitful scoundrel. And we may have missed the radical message that Jesus intends for us to hear in this parable. Anyone listening to this story when Jesus told it would have recognized the Pharisee as an exemplary person, someone people would look up to and respect. Notice that he fasts each week – not just one day, but two – even though Jewish law required no one to fast except once a year, on the Day of Atonement. This Pharisee exceeded that requirement. The Pharisee claims to have not committed adultery, and to never have engaged in any deceitful action; never to have stolen anything, and never to have participated in any act of extortion. And we have ever reason, in this text, to believe that he’s telling the truth. And finally, he is generous with his money, always giving one-tenth of ALL his income to support the temple and help the needy. The Pharisee has none of the vices of the Tax Collector, and he has many virtues for which to be commended. He is committed, disciplined, and obedient. Based on all his qualities, should Jesus not have been gushing with praise and holding up the Pharisee as an example to be followed? This parable is intended to shock us. Jesus intended his listeners to be surprised that it is the Tax Collector, rather than the Pharisee, who is called “right with God,” that is, what our reading calls “justified.” It is the Tax Collector who is accepted before God, not the Pharisee. So what is it that is so wrong with the Pharisee? The Pharisee employs the wrong measuring stick to determine the depth of his faith. He makes a measuring stick out of others – in this case, the Tax Collector. And by looking down on the Tax Collector, the Pharisee was exalting himself. That kind of comparing with others always produces pride. The Pharisee was a better citizen and church member than the Tax Collector, but the problem is it went to his head. He made the error of assuming, that the reason he was justified before God was because he was better than others. Jesus is the one and only measuring stick when we look at our relationship to God. Look again at the Pharisee’s prayer: “I fast twice a week,” he says. Jesus fasted forty consecutive days and nights. Next, he says, “I give a tenth of my income.” Jesus gave up everything, including his own life, on the cross. So what was wrong with the Pharisee’s faith? Quite simply, it was for show – it was for HIS honor and praise. 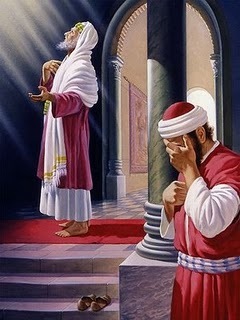 The Pharisee prayed to be heard, fasted to be seen, and gave 10% of his income to be congratulated. The Pharisee supposed that if he was more devout, and more committed, and more obedient than those around him, that he could earn God’s acceptance. As for the Tax Collector, we see a different picture. To actually see a tax collector in the temple was highly unlikely. Tax Collectors usually had no interest in going to church or in devoting their lives to God. Furthermore, tax collectors had no respectability as Jewish citizens. They were considered traitors – because they, though Jews, collected taxes for Rome, the country that invaded, and now ruled over, Israel. And they were considered thieves. It was said of tax collectors, that, if they collected too much, they simply pocketed the excess as profit. But something about this Tax Collector is different. He understands God to be merciful, and acknowledges himself to be a sinner, and is willing to humbly plead with God for a share of God’s mercy. Note that he doesn’t offer any excuses or alibis. He doesn’t offer any virtues to impress God. He doesn’t try to “sell” God on his good points. He doesn’t try to lift himself up in God’s eyes by comparing himself to someone worse than him. No, he comes before God, honestly confessing that he has not measured up to God’s standard. The measuring stick for our lives is not, “How are we doing compared to others.” Rather, the measuring stick of our lives is Jesus – the only one who has perfectly fulfilled the demands of the law and the prophets – and compared to that measuring stick we all fall short, we have all sinned. This morning, we baptize Aubrey Anne Timmerman. When we come to this baptismal font for baptism, whether as a baby or as an adult, we come to receive a gift. We don’t come to this baptismal font to parade our goodness before God. Rather, we come acknowledging our need for God’s mercy, and that we can never merit or earn God’s grace that is poured out upon us in this Holy Sacrament. We come to this baptismal font simply to receive. And whether we were baptized recently or 50 years ago, or even longer, the promise of God’s free and abundant grace poured out into our lives still stands – it is still valid. There is no expiration date on God’s promise, made to us in our baptism. Through Jesus’ death and resurrection, we are children of God, members of the royal family, inheritors of eternal life – our sins forgiven, washed away in the waters of our baptism. What God is after, is our hearts. That’s what God has always been after. That’s why God came down to us in his Son, Jesus; that’s why Jesus gave his life for us on the cross; that’s why God raised his Son from the dead – God seeks to draw our hearts to him. This parable presents us with two judgments: The Pharisee makes one judgment as to who is right before God, and Jesus makes another. Need we guess as to whose judgment will stand for all time and eternity?